This 4-way vaccine, often referred to as distemper, is an important combination of upper respiratory and intestinal pathogens of cats. These are so common that many cats may already carry or have acquired rhinotracheitis (herpes) before their first vaccination. However, vaccination does help to stimulate immune response and limit the course of clinical disease (much like the human influenza vaccine). Feline chlamydia is often a component of the feline upper respiratory complex and the underlying cause of most early ocular infections in young kittens. Feline calicivirus (FCV) is highly contagious and can cause severe clinical disease. We see many FCV outbreaks throughout the year in shelters and rescues. This virus can cause painful mouth ulceration on the surface of the gums and tongue. Feline panleukopenia (feline distemper) is a severe viral disease of cats that wipes out their immune system, similar to parvovirus in dogs. This is also a highly contagious and life threatening virus. Kittens should receive vaccines at 8, 12, and 16 weeks of age and again at 1 year; then it should be re-administered at 3-year intervals. We can also titer at 1 year or at any interval to determine viral vaccine coverage. At CHVA, we strongly recommend only using Merial PureVax Feline Rabies vaccines – the only non-adjuvanted rabies vaccine for cats. Adjuvanted rabies vaccines (such as Imrab-3, Defensor 3, Rabvac 3) all have adjuvant, a chemical solvent component that accentuates the absorption of the vaccine into the animal). This adjuvant material has been implicated in cats developing vaccine-site soft tissue sarcomas, which is a problem we hope to never see in your cat as they can be highly aggressive tumors warranting limb amputation or extensive chemotherapy and/or radiation treatments. Rabies vaccines are required by law in the state of Pennsylvania. Rabies is a deadly viral infection that attacks the nervous system of all mammals. Rabies can spread to humans as well through animal bites, saliva, blood, or fluid exchange. In Pennsylvania, raccoon, skunks, bats and feral cats are the most common sources of the virus. We do see the occasional dog, deer, cow and horse affected as well. There is no cure, and most animals require euthanasia if symptomatic. There are strict state-enforced quarantine rules for non-vaccinated dogs and potential bite exposures, so keeping rabies up-to-date is very important. Pennsylvania law requires all cats older than 12 weeks of age be rabies vaccinated by a licensed veterinarian. A follow-up rabies vaccination at 1 year is required and then every 3 years after that with Rabies PureVax 3-year vaccinations. In order to qualify for a 3-year rabies vaccine, it must be given within a 30-day window of the due date (or prior to end of the due date) or the 1-year vaccination will be re-administered. While we can titer rabies vaccines to check protective levels, Pennsylvania state law still requires re-vaccination despite titer-able levels. The only time a rabies vaccine waiver may be provided is if the animal suffers from a severe reaction to the vaccination or is in such poor health status that the vaccination could become life threatening to the animal. A copy of this waiver must be provided annually with a physical examination and kept on file with the Department of Health, otherwise the pet will be subject to court-ordered euthanasia and testing should a bite or exposure occur. Feline Leukemia is a fatal contagious virus with no known cure. If a pregnant cat is infected with Feline Leukemia, her kittens will most likely be born with Feline Leukemia. It is important to test kittens for FeLV prior to vaccinating and prior to bringing a new kitten into your home if you have other cats. Feline Leukemia is easily spread between cats in the same household. Ultimately, Feline Leukemia will destroy your cat’s immune system making them susceptible to common diseases a healthy cat typically could fight off. At CHVA, we recommend all outdoor and indoor-outdoor cats be protected for Feline Leukemia. We can begin vaccinations at 8 weeks and booster one month later. Annual re-vaccination is currently recommended. 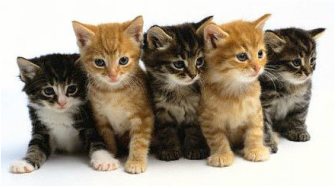 The American Association of Feline Practitioners currently recommends ALL cats be vaccinated against FeLV as kittens. However, due to the likelihood of indoor cats becoming indoor-outdoor, at CHVA we feel that an individual approach to vaccination scheduling and risk factors for the individual cat need to be considered before making this a core vaccine. Currently, there is no available vaccination titer on the market for FeLV vaccines.